It’s always fascinating to go back and read the original sixties Marvel comic books, to get a sense of just how influential or informative they were on the generations of writers and artists who followed. While it’s not quite as spectacular a mess as The Incredible Hulk or The X-Men, I’ll admit that I never entirely warmed to the classic version of The Avengers. 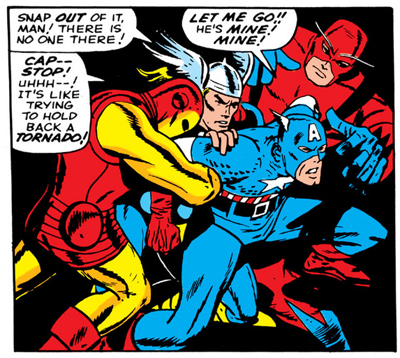 I like select stories – Roy Thomas’ Kree-Skrull War, Starlin’s Infinity trilogy – but, as a whole, these classic Avengers comics never really grabbed me. Don’t get me wrong. These are massively iconic and influential books, and they’re well constructed, laying down a blueprint for decades of adventures to follow. There’s a sense of wry self-awareness here, and there’s no denying that these are vitally important classic superhero comics books. However, I could just never bring myself to love them.